In an attempt to protect her romance series brand and stop other’s from copying her work, in September of 2017, Faleena Hopkins (also known as Sabrina Lacey) and her lawyer filed a word mark trademark for ‘cocky’. A wordmark, word mark, or logotype is usually a distinct text-only typographic treatment of the name of a company, institution, or product name used for purposes of identification and branding. Examples can be found in the graphic identities of the Government of Canada, FedEx, Microsoft, and IBM. In the United States, a word mark can be registered as a protected intellectual property. Sometimes, the text itself can be registered too. However, the purpose of doing so must be more specific than a general word. So for example, Tim Cook of Apple Computers, cannot sue you if you use the word ‘apple’ in a book title, but he can file a lawsuit if you try to open up a computer company under that name (Apple). Hopkins is the author of a collection of humorous, steamy romance novels titled The Cocker Brothers Series. Her act of trademarking the word ‘cocky’ may seem pretty harmless at first because it would seem she was just securing her claim to the brand she created. At the same time, making herself the only relevant author of the “Cocker Brothers” and “Cocky” branded books. However, readers and writers of romance novels recognize the word “Cocky”, as a general word in the industry. 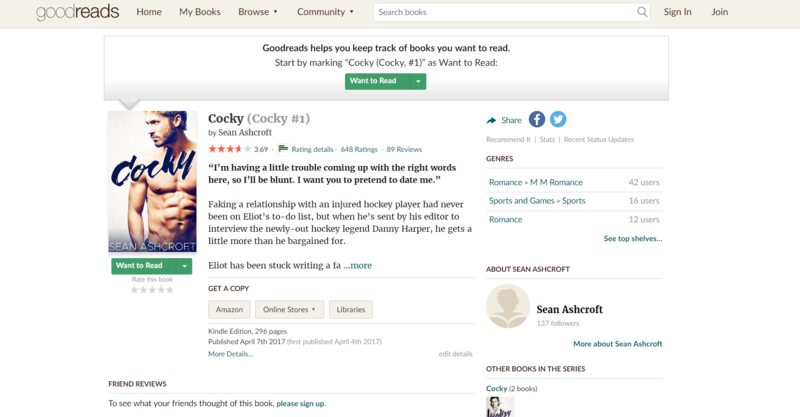 There are many books in the romance genre that has the word ‘cocky’ in the title. There’s nothing more catchy in the romance world than double entendre (double-meanings). Here are a few authors who have used the word “cocky” in the titles of their books. The word has always been quite popular in the romance genre, yet Hopkins seems to be the only writer who’s determined to cash in on the word. Her series, ‘Cocker Brothers of Atlanta’, has 17 books in the series, and she’s really determined to define her work as a brand that can be trademarked. Trademarking, of course, is not new in the publishing community. Authors and publishers do it all the time to protect their assets. However, the unusual thing about what Hopkins did is, she did not just simply copyright the name of her series, ‘The Cocker Brothers’ or ‘The Cocker Brothers of Atlanta’ she trademarked the word ‘cocky’ itself and is going after other romance authors who have the word ‘cocky’ in their titles. As shown above on the US Patent Office database, which was successfully registered on May 1st 2018, the trademark filed by Hopkins for the word ‘cocky’ is specifically for a word mark. She uses a specific logo for the word, with letters in a distinct style and form. She uses this word mark on her covers. Meaning, that word mark is something she can protect as a brand. If other authors want to try and replicate that exact typeface with the word ‘cocky’ in their title, then she has a good case to file. However, that’s not what has been happening. It seems Hopkins has also copyrighted the general word ‘cocky’ itself without the stylized mark. As reported, she has been sending copyright notices to authors who have used the word ‘cocky’ in their title. Many authors have been personally contacted by Faleena. One author who received such notice was the author of the book “Mr. Cocky”, Nana Malone. T.L. Smith and Melissa Jane who previously had a book titled “Cocky Fiance” reportedly changed the title of their book to “Arrogant Fiance”, as per Amazon. Apparently, Faleena is sending all authors a cease and desist letter while alluding that she will sue them if the authors do not comply with her demands of changing the titles of their books. Indie authors labeled the situation as trademark bullying at its finest, thus, the birth of the hashtags (#cockygate, #byefaleena, and #freecocky), all dedicated to Hopkins. People are not buying it, saying that it is possible to return a Kindle book if you accidentally bought the wrong one. The netizens are not buying that either, saying it’s a huge lie for Hopkins to claim that scaring authors into making drastic changes because of her faulty claims of trademark costs nothing. These authors have to pay for their own covers, their own logos, their merchandise and marketing materials. It is a complete lie to say that it is a harmless claim. Imagine if an author wrote and published a book called “Forever Cocky”, there’s a great chance this author has been planning out a blog tour and all the marketing plans have been sorted out before the release of the book. All the bookmarks, merchandise, and logos have been printed out with that title, costing money, and Hopkins is requesting (or perhaps demanding) it all to be tossed aside because she claims undisputed ownership to the word ‘cocky’. If you think about it, with threats of lawsuits, Hopkins is really demanding a lot from these authors. Sadly, most authors don’t have the financial capacity to properly deal with a threat like that, even though it doesn’t have any solid grounds for winning. Hopkins is relying on the fact that people normally succumb to the pressure. If the Cocky trademark is allowed to stand, what does this mean for other creative industries? Will a Thriller writer trademark the word ‘sleuth’ or another general word that is popular in that genre? Will the estate of Michael Jackson trademark the word “Thriller” and demands one can use that work in any title again, ever? These are the questions that other creatives are asking. Anyone who works with the titling and branding of anything creative – directors, production entities large and small, all writers – the #cockygate situation deserves your urgent attention. It’s implications are huge and extend far outside one genre of fiction. When Kevin Kneupper heard about #cockygate he decided to do something about it. For more updates, keep a heads up for our next article. We are currently doing more research and will be posting additional information as the issue progresses. What do you think? Is Faleena Hopkins right for trademarking the word ‘cocky’ and sending cease and desist letters to other authors, or has she gone too far? So apparently, aside from this current fiasco that Faleena Hopkins is involved with, she has also made other questionable claims in the past. In her blog post, last January, Hopkins gave details about her book cover photoshoots for her fans to see. She claims in the blog that ‘some… authors were copying me on purpose’ by using the same licensed stock images for their covers. In the publishing community, it is VERY LIKELY for authors to use the same stock images for their covers because the photographers (who are the owners of the image) are likely to sell the permission to their image to as many users as possible, for practical reasons of course. That’s why she decided to do her own photoshoot, which she also claims was an original act for any indie author. I wonder what Michel Sauret has to say about this claim though. Being a professional photographer, he designed the concept of his own book in the year 2012. Sauret may not be the one to actually take the photo (BUT he was the one directing his friend how to), because he was ***clears throat*** actually the MODEL for the cover as well. Many people think that it was indeed too cocky of Hopkins to position herself as wholly unique and to assume everyone else in her path are mere copycats and that she has the right to demand everyone else to adjust for her. Authors, both indie and well-established, have been reacting to Hopkins’ claims. Left and right, she has been receiving negative feedbacks about her actions. In fact, a page has been built dedicated solely to cancel-out her trademark claim of the word cocky. The site now has 24,282 signatures, with the target of 25,000 almost achieved. As of writing, today May 14, when you try to search for Hopkins’ Facebook Page can no longer be found. Maybe because many people reported her? OR maybe she realized how huge of a mistake she is making? We will keep you guys posted on this. Be sure to like our page to get the latest updates. Stay cocky™! Ever since the registration of Faleena Hopkins for the word “cocky”, authors – both indie and established – have been clamoring all over the internet to make their protest against the motion as loud as possible. On May 14, 2018, just 13 days after Hopkins filed for the said registration, author Kevin Kneupper has formally filed for a motion to cancel the trademark filed by Hopkins. Of course, Kneupper is not alone in this advocacy to stop Hopkins from winning her claim to the common word. This petition has made the possibility of Hopkins not winning and owning the word at all! Many authors are currently keeping their eye on the issue, hoping that the trademark claim will not successfully go through. If you go and visit the website of the US Patent and Trademark Office, here’s the updated status of Hopkins’ initial file for registration. So there, I guess we will be waiting for either one of two things to happen: The trial will push through and one of the two parties will win it… OR, Hopkins will drop the trademark motion, after realizing that it is a silly idea in the first place. We will be posting more updates soon.